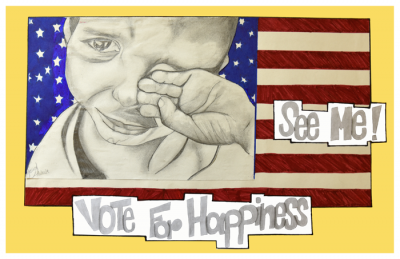 EMK Poster: "Vote for Happiness," an original design by BPS high school student Jessica Andrade for the Political Poster Project at the Edward M. Kennedy Institute. In the midst of this dismal electoral season, there is a ray of sunshine on Columbia Point. No, I don’t mean the office of the Dorchester Reporter, although that’s a bright spot for sure. Instead, I am referring to the Edward M. Kennedy Institute and the Political Poster Project that the institute’s Education Department is promoting in Boston area schools. The project is an invitation for students to create a campaign poster that represents their ideas and ideals of leadership. Any student can participate, either by sending a digital file of a completed poster, or by visiting the institute to make an on-the-spot version in a conference room that has been converted into a mini-charrette studio. 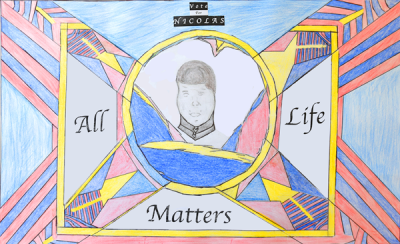 Two weeks ago, posters by students from Boston International High School were on display at the Erick Jean Center for the Arts in Four Corners. Those posters have now been moved to the EMK Institute to be part of a larger exhibition that is scheduled to continue through the middle of November. It is ironic that the Political Poster Project should be hosted at the Edward M. Kennedy Institution. The EMK Institute is a symbol of political cooperation, which seems like an anachronism when contrasted to the current political climate. But EMK is especially relevant now as voters are faced with stark choices and those in the middle feel the ground crumbling beneath their feet. On one hand, many are pushing back against the ultimate establishment candidate; on the other hand, many are wary of the anti-establishment candidate who threatens to tear everything apart. There is no denying that Ted Kennedy knew the rough and tumble of politics. Yet once in office, he was the very model of a consensus builder, working across the aisle to get things done for people in the middle and at the bottom. He had the ability to make friends, which is at the heart of good government. Not least of all, Ted Kennedy was a first-class champion of civil rights here and around the globe. 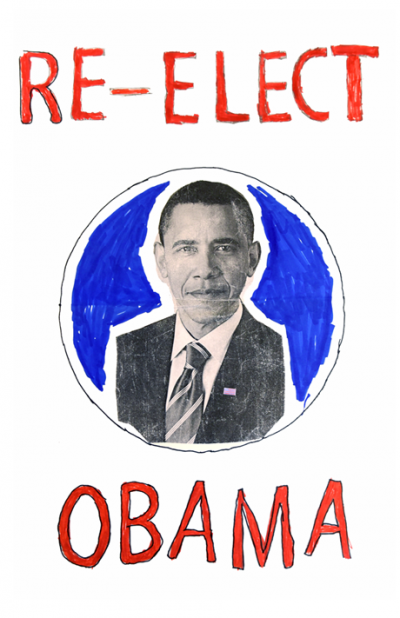 Re-Elect Obama: Poster by Najmo AduWe can be proud to have the EMK Institute in Dorchester. The architecture shows the majesty of the institution and of the office of senator itself. A low windowless box, its monumental design complements the JFK Library next door. The exterior is painted to blend in with the color bands of our coastal sky, and on the foggy day that I visited, the building seemed light enough to float away. Inside, a vast lobby and spacious passageways surround a full-scale replica of the US Senate chamber in Washington. Arrayed in opulence, the chamber stands in stark contrast to Boston International High School / Newcomers Academy (BINcA), which opened six years ago in the former John V. Thompson School at 100 Maxwell Street, near the Fairmount Line at Morton Street. BINcA is a Boston public school that embraces immigrant adolescent English language learners and their families. New education standards have created new challenges for English Language learners who represent about 10 percent (and growing) of the student population in school districts across the US. Locally, BINcA is working to meet this challenge by fostering greater sensitivity to cultural diversity and by addressing the needs of students with interrupted formal educations. Nationwide, BINcA was cited as a model of successful ELL programming in the report, “Schools To Learn From: How Six High Schools Graduate English Language Learners College and Career Ready,” released by the Stanford University Graduate School of Education last December. These are the students who jumped at the chance to join the system by making posters that communicated something about their dreams and aspirations. It’s a hypothetical question: What would you do if you were president? Few could resist the urge for self-aggrandizement, the chief characteristic of most campaign posters. But whatever the motivation, and despite the make-believe, students were drawn into the democratic process, and every attempt to assert themselves could be seen as a counterbalance to the larger issue that is swirling around the real election: exclusion vs. solidarity. The media express the polarization of the electorate, generating feelings of revulsion and aversion that can turn into apathy. But the media don’t know everything, so young people are moving beyond it to find new ways to communicate – for instance, seizing the opportunity to send a message that can be woven into the greater discourse by means of the prestige of the EMK Institute. Vote Cleusa for President – No to racisme. The ELL students who participated in the poster project represent hope for the future. In the face of the decline in the US birthrate, these students and their families allow us to participate in the global economy. Transnational people are our bridge to the world; they symbolize global peace and cooperation. Recently, BINcA students visited the EMK Institute to see their work on display. While there, they participated in a visitor experience known as “Today’s Vote,” part of an EMK educational program that is truly interactive. Students entered the replica Senate chamber and sat themselves at the lawmakers’ desks. EMK staff members addressed the group and presented a bill that is actually before the US Senate right now. Then the mock Senate considered the bill in question, with student-senators standing to deliver opinions for and against. Finally, a vote was taken. By coincidence, the bill introduced that day was S. 678, the English Language Unity Act, which would make English the official language of the United States. In the debate that followed, BINcA students were able to stand up and say whether they believed the Unity Act is a good idea or not. Thanks to the legacy of Senator Kennedy, young people have a place – and the voice – to speak up for change. James Hobin, who teaches art with colleague Celoni Espinola at Boston International High School, worked with student-artists to create art for the EMK Institute’s Political Poster Project. Hobin is a Savin Hill resident and artist who writes a regular column for the Dorchester Reporter.